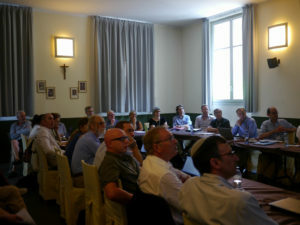 For five beautiful days in mid June, an international group of more than thirty academics – archaeologists, textual scholars, ancient historians, and numismatists from Israel, Europe, and North America – gathered in the glorious environment of the Villa Cagnola in Gazzada to discuss the emergence of the Hasmonean state. This conference, “The Period of the Middle Maccabees: From the Death of Judas through the Reign of John Hyrcanus (ca. 160-104 BCE)”, was organized by Andrea Berlin, the James R. Wiseman Chair in Classical Archaeology at Boston University, and Paul J. Kosmin, John L. Loeb Associate Professor of the Humanities at Harvard University, with the generous support of the Enoch Seminar. 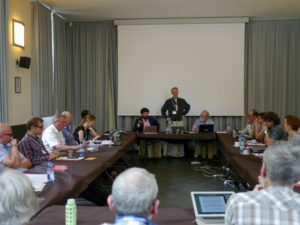 The conference explored the emergence of the early Hasmonean polity in three perspectives. 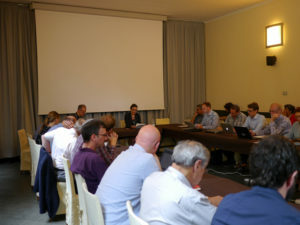 First, Andrea Berlin, Katell Berthelot, Edward Dąbrowa, and Benedikt Eckhardt, discussed in what ways 1 Maccabees constructs a legitimizing narrative of the leadership of Jonathan and Simon Maccabee and to what extent this should complicate the use of this work by archaeologists and historians. 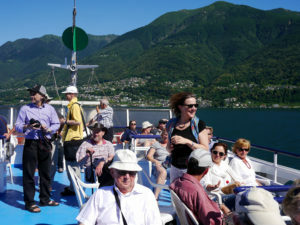 Robert Doran, Avner Ecker, Francis Borchardt, Jonathan Bourgel, Lester Grabbe, Jutta Jokiranta, John Kampen, and Magnar Kartveit explored the wider world of scribal culture among Judeans and their neighbors in this period, including the Qumran texts, the Maresha inscriptions, and the fragments of Eupolemus. Second, a full array of up-to-date material evidence from the various regions of the southern Levant in the second-half of the second century BCE was presented, with an eye to understanding patterns of settlement change, the materialization of cultural identity, and the extension of Hasmonean and Jewish control in the region. Donald Ariel, Yuval Gadot, Moran Hagbi, and Ayala Zilberstein discussed material from Jerusalem and Judea, Deby Sandhaus Idumea and the Shephelah, Yehiel Zelinger the Plain of Sharon, Dvir Raviv southern Samaria, and Uzi Liebner and Danny Syon the lower Galilee and northern coast; Sylvie Honigman and Gerald Finkielsztejn offered responses. A remarkable landscape of state control, neighborly violence, and materially-enacted identities emerged, in a finer grain, perhaps, than exists in others region of the ancient Mediterranean or Near Eastern worlds. Finally, we considered how these events in the southern Levant, so well documented in text and material, fitted into the wider world of great power politics – the expansion of the Roman Republic and Parthian empire, the decline of the Seleucid kingdom, and the revanchism of the Ptolemaic house. Boris Chrubasik, Christelle Fischer-Bovet, Catharine Lorber, and Julien Olivier (in absentia) demonstrated the continuous interventions of the Ptolemies into this Seleucid region, Altay Coskun and Paul Kosmin explored Seleucid dynastic conflict, and Erich Gruen and Duncan MacRae debated the impact of Rome. 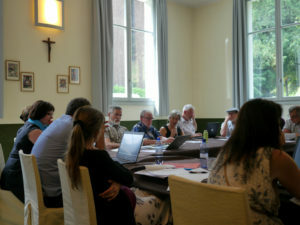 “The Period of the Middle Maccabees” was a great success, producing focused conversations on a number of historical problems, while encouraging an interdisciplinary engagement and an openness to new evidence and approaches. We very much look forward to presenting our findings to the world!